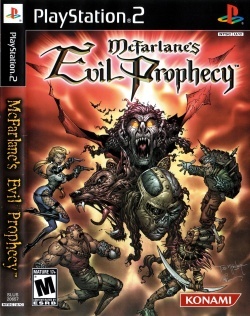 Game description: Set in the 19th century, McFarlane's Evil Prophecy allows you to control a party of four unique monster-hunters with different fighting abilities. To fight through hordes of evil creatures, you can use all types of attacks, including magic and melee. Come together with three other players in co-op mode and unleash more powerful attacks. As you collect souls, you unlock more special moves and weapons. You'll need all the help you can get to battle six great monsters and their evil minions. Based on Todd McFarlane's series of Monsters action figures, Evil Prophecy sets players on an action packed adventure to hunt down the some of the most famous creatures in literature. Armed with unique fighting abilities and lethal combo attacks, one to four players can hone their skills against McFarlane-designed characters like Dracula, the Werewolf, and Frankenstein's Monster. This page was last edited on 20 April 2016, at 15:58.